The Digital Gift Card can be spent in any Turtle Bay UK restaurant to fully or part pay for your restaurant bill and/or any of their tasty sauces! The Digital Gift Card must be printed out and taken into the restaurant. 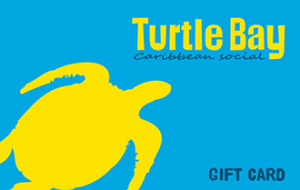 The balance on the Digital Gift Card can be used for purchases at Turtle Bay in full or part payment. In the event of 12 months of consecutive non-use, the Digital Gift Card will expire and the balance remaining will be deducted. Digital Gift Cards may not be exchanged for cash or other vouchers or used as a deposit. No change will be given when a Digital Gift Card is used to purchase goods or services but the balance may be applied to future purchases. The minimum amount required to activate a Digital Gift Card is £5 and the maximum load value is £250. As we do not collect information about Digital Gift Card customers, we cannot replace or reimburse the value of the Digital Gift Card if it is lost, stolen or damaged. Digital Gift Cards should be treated as cash. Turtle Bay reserves the right to amend the terms applying to Digital Gift Cards at any time.